me of the two bells on top of vintage alarm clocks. He was born into a gypsy family in Belgium, hence his natural association with “gypsy music.” He discovered jazz around the age of 20. With violinist Stéphane Grappelli, he founded the Hot Club of France Quintet in 1934. It was a jazz band with an unusual configuration: stringed instruments only. The line-up varied over time, but Reinhardt was the central focus and kept the band active until 1948. Artists of any stripe– or any striver, really– could find no better role model than Django Reinhardt. Why? He was badly burned at age 18. The third and fourth fingers of his left hand were left partially paralyzed. Out of necessity, he invented an entirely new jazz guitar technique: he played all his solos with just two fingers, using his injured fingers only for chording. He not only faced his handicap, he used it to achieve new heights of artistry. Here’s a larger detail image of the Django Alarm Clock. Scroll down to listen to one of his most famous compositions. You can find archival film footage of Django on YouTube, but it’s rather grainy and the sound quality is poor. Instead, I’m embedding a slideshow set to a pristine 1953 recording of Nuages (“Clouds”), perhaps his most famous composition. If you’ve never heard any Django Reinhardt, you’re in for a treat. I think you’ll enjoy the images, too– including some additional caricatures. What do you think? 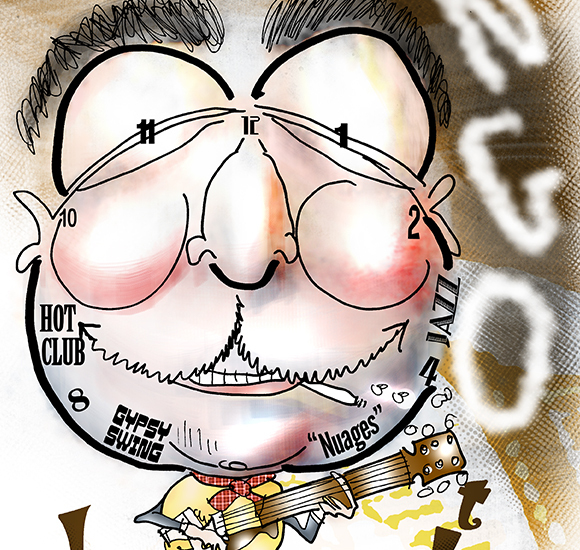 Ever heard of Django Reinhardt? Do you think he makes a good alarm clock? Hope you’ll leave a comment. Great illustration. Really liked the music too. My father was a musician, and one of his favorite artists was Chet Atkins. Django’s sound reminds me of Atkins, who was an amazing guitar picker. Thanks, Jimmy, very glad you enjoyed post. Yes, Chet Atkins was a phenomenal player. Could he really have been self-taught?? The mind boggles. Guys like he and Django certainly open our eyes to the realm of human possibility. Many thanks for stopping by! Django is awesome. Who wouldn’t want to wake up to that? Many thanks for, er, clocking in! 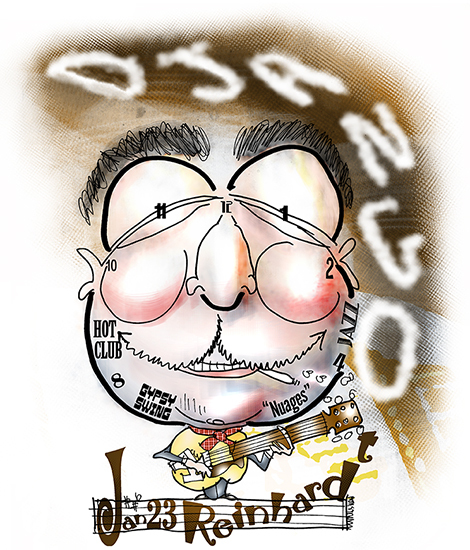 OMGosh…Django Reinhardt! thank you for telling us about him!! AMAZING! Luscious music. I knew about Stephane Grappelli but Reinhardt is a wonderful surprise. Such an inspirational a story! What talent! The smoke that turns into his name is super. And I love how you worked his birth date into the staff!! Happy to hear that my upload is welcome. Your upload of Django Reinhardt playing “Nuages” is most welcome, sir. Thank you very much for making the recording and video clip available on YouTube, and for allowing me to embed same in my post. I’m sure I speak for all visitors when I say it is a delight. Yes indeed, we all need inspiration– so thank you very much, Inge, for that inspiring comment! I am indebted to you for your previous comment about hand-drawn illos vs. photo manipulations. I think the latter have a place, but must agree that quick sketches based on intuition and first impressions have a special energy. I intend to experiment with photos in future, just to improve my Photoshop skills, but I needed that reminder that energy and truth seem to spring from a deeper place. That’s a very clean production considering the age of the recording. Thanks for posting this. I was a classical music theory major as an undergrad and my teacher Ted loved this guy. Your illustration shows your deep respect for the guy. Very cool, two thumbs up. Your kind comment was music to my ears– thank you, Amelie! The music is beautiful. I could imagine sitting in a posh restaurant with it playing in the background. Thank you for introducing us to such a wonderful musician. I think it’s amazing how his handicap did not let his dream vanish. He really strived to make a great success. Truly a wonderful inspiration. It’s one thing to read about his battling back from such a debilitating injury, quite another to imagine the time, effort, and force of will it must have required. Inspiring indeed. Many thanks for your kind and cheery support!